Here's a quick and cute card to brighten your Monday! I'm playing along with the CAS challenge on Splitcoast. This stamp set is so sweet - it was one that I knew I had to purchase as soon as I saw it in the catalog. 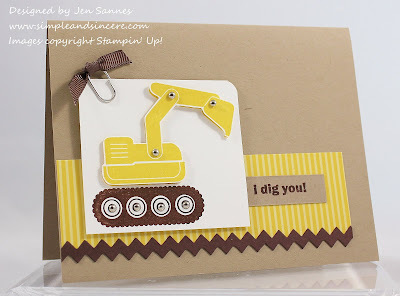 I love the diggers and funny little sentiments, which are perfect for cards and scrapbooking. My son has had his eye on it as well, so I'm sure once he sees this card he'll want a turn using it. Adorable! This set was a must have for me! Love the CAS look of this card and the colours are fantastic! the well placed brads are the perfect touch to this as well- everything you make turns out so well! This is the cutest card ive seen made with this set! Awesome job!